I thought this posted last night, my Internet is clearly a little slow :[ So this is two posts in one! This weekend was busy and relaxing at the same time. After roughly 7 loads of laundry on Saturday and a short run, food prep was calling my name. 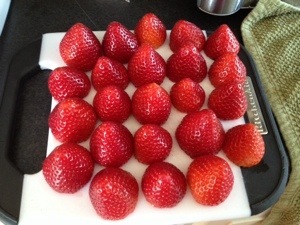 Strawberries were super cheap, so I couldn’t pass them up. Back to my short run. I met a girl at my job the other week and we started talking about running. She ran cross country in high school, and since starting college she’s run off and on. We decided we should run together because while she’s a solid 5’11”, she runs at my pace. 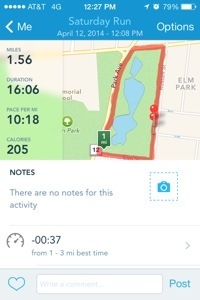 We were aiming for 3 loops at the park, which would be around 2.25 miles, but we cleared a solid 2 laps running, then walked a lap. Here’s what our run looked like. For me, this was a little slower than the week before, but I did two laps instead of 1.25 laps. Longer distance = slower time, so I don’t wear myself out. I’m going to try to do this loop this week and go for 3 laps. 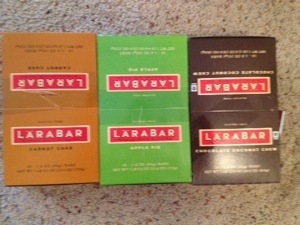 Happily, my Larabars came in Friday, but I didn’t open them until Saturday. I was so excited when they arrived, that I showed everyone at work. 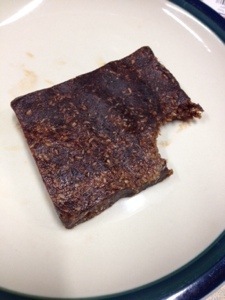 I also made a new fruit bar recipe; this time using unsweetened chocolate, coconut oil, unsweetened coconut and sunflower seed butter. FREAKING DELICIOUS! 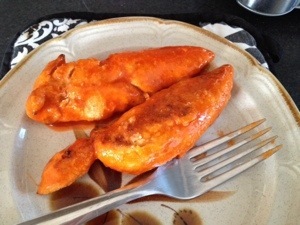 I also made paleo buffalo chicken tenders with coconut flour and Frank’s Red Hot. I definitely miss Ranch dressing, but these were great without it. Today was the first day of my kick start and I did great. I have confidence that this 21 day challenge will be easier than the 30 day challenge I did when I first started paleo. Breakfast was banana and egg pancakes with walnuts and 20 ounces of unsweetened iced chamomile tea. 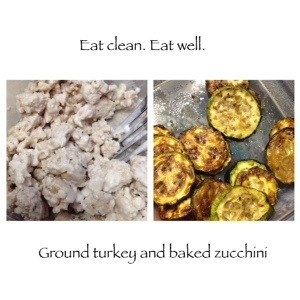 I had some raw veggies and fruit throughout the day and lunch was ground turkey and baked zucchini- seriously, best idea I had all Sunday night. I also brought one of my homemade fruit bars. Sunflower butter and 100% cacao- AMAZING! 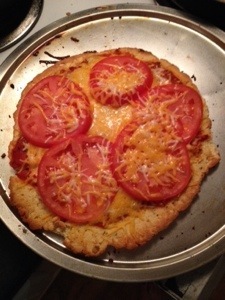 For dinner I tried a new recipe- I’ll post it tomorrow!- Coconut Flour Pizza Crust. It was so easy to make and while it had a sweet taste, it’s a great alternative to real pizza. I need put just tomatoes on this one, and I need to figure out more toppings to use. I had been considering buffalo chicken pizza, but got a little lazy this evening. Maybe that’s a possibility for next time. Well, I’m heading to bed and binge watching Netflix I’m predictable. Hopefully day two goes just as smoothly.